Temple Grandin is an adult who has accomplished much in her life. She is an accomplished author, she holds a PhD in Animal Science from the University of Illinois, she is a celebrated public speaker, and she has autism. Temple was diagnosed with autism in 1950, many years before support services and early intervention were available for families. While many thought that Temple was never going to speak, she excelled with great success. She attributes her success to her mother's dedication to engaging her in structured activities. Books written from the perspective of a person diagnosed on the spectrum are among the most important resources for families dealing with a diagnosis of autism. Temple has a rich collection of information and experiences that help readers understand how she perceives the world. The books also give insight into possible techniques for helping autistic children. The list of books is impressive, ranging from topics about autism, mental processing, and livestock. She notes that she used to think that everyone processed information the same way she does, visually. Gradually she began to understand that other people have minds the work differently. The article offers insight into learning theories, especially Gardner's Seven Intelligences. This is complex because the autistic mind process things differently from the neurotypical mind but there are differences among individuals with autism as well. No cookie-cutter approach is going to work for every individual on the spectrum. However, a combination of interventions catered to the needs and thinking patterns of the individual can work wonders. 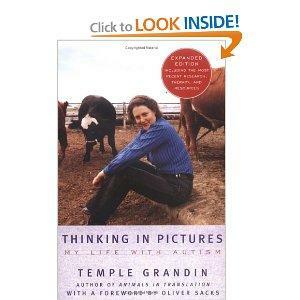 Temple Grandin authored the book Thinking in Pictures and her experience is very valuable to the autism community. Chapter One: Autism and Visual Thought offers insight into the visual mind that literally translates every experience and every spoken word into a sequence of images. While this type of mental processing presents significant challenges, Temple acknowledges the many benefits of thinking in pictures as well.She also discusses categorization, a process that is typically carried out through language. We use words to organize the world, when an individual is unable to use words for this purpose, she must develop another way to put things in order. This may be the source of some behaviors we commonly see on the spectrum. The need to categorize and organize may manifest in aligning objects and the need for order and routine. Ms. Grandin has had a significant impact on the autism community, offering excellent resource and guidance for parents, professionals, and individuals diagnosed with pervasive developmental disorders. The video Temple Grandin: Reinventing Autism helps viewers understand the importance of engaging children in early intervention programs as well as the importance of parental involvement in therapy. Each individual is unique and nothing makes this more apparent that the various ways that we process information. No two people have the same exact thought processes and learning styles vary across the board, whether on the autism spectrum or not. Just as we have the eight intelligences in education, we have different learning styles in autism as well. .